My readers are some of the smartest, frugal, and innovative readers on the Web! They are willing to think outside of the box when it comes to improving their homes and making their lives easier. Advertising at Beams and Dreams would not only serve as a savvy business adventure, but it would bring you into contact with savvy bloggers! So…what’s that mean? Here are the numbers. $25.00 for 30 days-always starting at the 1st of the month. I do NOT charge for giveaways for my readers, but I do ask that the giveaway is worthwhile for my readers. Just contact me, and we’ll see if it will work out. Product reviews are welcomed, but I would encourage a giveaway for readers. What better way to expose your company to others? If you’re interested, please e-mail me with the title “Advertising” in the subject bar. If you need an ad, Danielle at The Design Girl will make one for you! She charges $20.00, and she personalizes it to what you need. 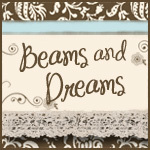 Thank you for your interest in advertising on Beams and Dreams. I look forward to working with you!